The former Labour leader's sassiness, seemingly lost during the 2015 general election, returned in time for his 2017 campaign. While you were all looking at Jeremy Corbyn, another (former) Labour leader was having a great campaign. A week before the Easter holiday, as Theresa May had planned to go back on her promise not to call an early election but hadn’t told the country yet, Ed Miliband was already prepared. 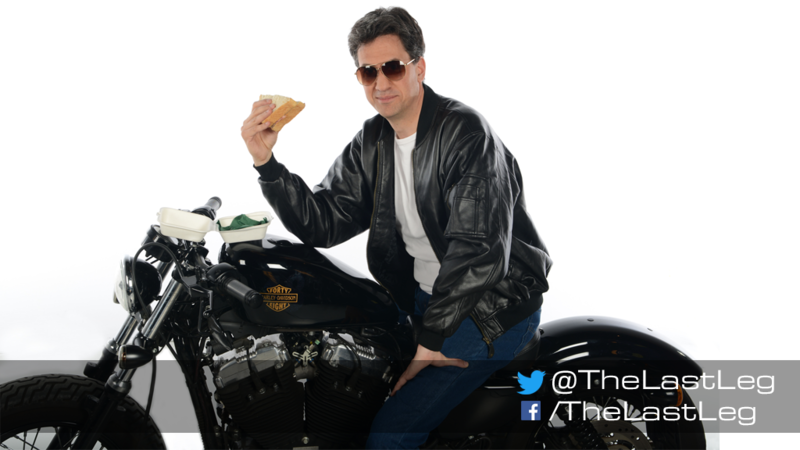 In April, as a guest on the Last Leg show, he avenged his 2015 self by re-shooting the infamous “bacon sandwich photo”, with a lot more swag: leather jacket, motorcycle and sunglasses, he made that sandwich respect him this time. Hell yeah. He also formed in own band – the MiliBand – and cursed live on TV. Move along, Jez, Sassy Ed’s back. On the campaign trail to be reelected as the MP for Doncaster North, Miliband enlightened the Facebook feeds of his Milifans, posting daily selfies with his constituents, offering photos of his “campaign haircut” and self-deprecating humour. He also made great use of the “cool bacon sandwich photo” while meeting with local bikers. It was all fun and games, but Ed never forgot to slag off his opponents. He called Theresa May “weak and feeble and spineless” over climate change and condemned her attitude toward US president Donald Trump. But Ed’s campaign culminated on 2 May, when he encountered a Doncaster local in need while canvassing. “Out canvassing with ED MILLIBAND [sic] and he starts mowing the lawn for a lady (we have her vote! )” Labour canvasser Jayne Naphtali posted on Facebook. Ed Miliband then shared the post, praising “Labour’s grassroot strategy in action”, on his Facebook page and Twitter account. Trust Ed never to miss a pun. “He really did mow the lawn,” another canvasser confirmed on Twitter, offering more of a close-up. Ed Miliband, Doncaster's own handyman. Yet another meme was born. On 7 June, the “lawn-mowing” story got a happy ending, as the local lady and her lawn mower proudly posed with an “Ed Miliband for Labour” poster and the man himself. Many Labour supporters may hope that his campaign, too, sees a happy ending tonight. If only to soothe them on social media after a Tory victory.